Originally launching as ‘Telstra WiFi’, as part of a push to build a WiFi Nation, Telstra has now decided on calling it’s network ‘Telstra Air’. Already available at over 4,000 hotspots, in 250 towns around Australia as part of the earlier free WiFi trial, the next step will be Telstra customers with the Gateway Max modems opting in to participate – sharing some of their bandwidth in exchange for being able to access their own home broadband usage at other hotspots. Telstra Air is set to launch next Tuesday, 30th June. Telstra has also joined forces with Fon, along with many other operators around the world. This allows Telstra Air customers to take their allowance with them overseas, with ‘free’ access at over 15 million hotspots in 18 countries. Making things easy, there will be a ‘Telstra Air’ app for smartphones for finding the nearest hotspot, which will presumably augment the existing Fon app. 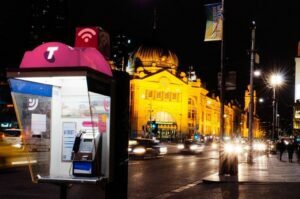 There are plans to work with councils and other business owners to further expand the Telstra Air network too, beyond the existing payphones and home internet hotspots. If you’re not part of Telstra Air — no Telstra Home Broadband with the Gateway Max, if you’re only a Telstra mobile customer, or not with Telstra at all — you’ll be able to purchase 1-hour, 1-day and 5-day passes for $6.60, $10 and $23. Presumably Fon customers from overseas will be able to also use Telstra Air hotspots when they arrive down under.